Robin Holland – Hi Everyone! I am going into my 27th year at MCC and can honestly say I’ve loved every minute of it. A big part of that is the incredible people I work with☺ I started off as a PreK and Nursery teacher. I then worked as Assistant Director, Director and now Owner/Director. I love being in the classroom and am always glad when I have a chance hang out with the kids☺. I graduated from Saint Anselm College with a BA in Psychology and from Southern Connecticut State University with a Masters in Psychology. In both of these programs I’ve taken numerous classes in early childhood, along with other classes in early childhood at Dean College in Franklin where I live. I have three great children, Nicky (24), Zacky (21) & Kacey (18). All three have attended MCC; Zack and Nicky have been working here for years and Kacey started working 3 years ago after school. You’ll have a chance to see Zack and Kacey during their college breaks as I’ll be putting them to work! I have a wonderful husband, Michael, who helps out a lot at school doing anything that needs doing. He does most of the shopping for the school and is known at the Franklin BJ’s as “Day Care Man”. When not at school I can usually be found with my Kindle or watching my Yankees on TV☺ Though I’m a HUGE Pat’s fan!! Cindy Dowd –I am so excited to be returning to MCC for my 28th year!! Every day is such a wonderful adventure with the children, I can’t imagine doing anything else. My professional background includes a Bachelor’s Degree in Early Childhood Education and a second in Physical Education. When not a school I live with my husband Henry in Holliston with our two year old cockapoo Buddy. We have 3 grown children Sam, Nick and Emily and they all live in the area. Our family grew by one when Nicholas married Shannon this past April. Making us even more blessed are our four grandkids ranging in age from 2 to 13 (all current or MCC grads!!). Our lives are full of fun, family and laughter!! Karen Caragliano – My name is Karen Caragliano, also known as "Mrs. C." I am happy to be returning to MCC for my 5th year. (WOW! Time flies!) I typically spend my time in Junior Kindergarten assisting Miss Cailyn, but I am lucky enough to sub in all of our classrooms so I get to know all of the children! I live in Norfolk with my husband John and our dog Brandy. We have 2 grown sons who are out of college and into the work force. We love to travel and cheer on our Boston sports teams. I look forward to a fun filled year ahead. I am looking forward to another year of growing and learning. Every year the fun increases! I am excited to welcome back old families and meet our new ones! Kathleen McMahon- Hello Families! I am excited to be your newest MCC Pre-K teacher this 2018~2019 school year! It`s going to be an adventure with lots of learning, laughter and friendship. A bit about me:) I have lived in Medfield with my husband Eddie, raising 3 sons~ James (24) a scientist with Pfizer, lives in Cambridge, Jonathan (22) just graduated Fairfield U and works at Toast next to Fenway, and Josh (11) is at Blake Middle School, 6th grade. I have worked in many areas of child care over many years! From teaching a number of kiddie classes at the Park & Rec, years of story time at the public library, substitute teaching, Map, and volunteering in preschool to high school!! All in my favorite town:) Some of my favorite things to do are gardening, art, cooking, family time & exploring all New England has to offer!! Tara Grady- I am super excited to be staring my third year at MCC. It has been so amazing working here and getting to know all of the wonderful children at this school. This will be my second year out in the Big Hall with the Nursery I group working with Miss Trish. I was a teacher in the Toddler room for one year also. I’ve been certified as a PreSchool teacher for about a year now after taking a course at Fisher College. When I am not at MCC I enjoy hanging out with my friends, playing disc golf, going for walks and traveling. I have one dog, Duncan who is very energetic so I like to take him on walks with me as much as I can. Music is my favorite so often times we have dance parties in the Big Hall. I look forward to seeing the familiar faces ad getting to know all the new faces!!! ​AmyBeth Bourgault - Hello kids and families! I am so excited to be joining the MCC family for a 3rd year! In addition to my employment at MCC, I’ve been the Nanny for the Churchill family here in Medfield for the past 8 years. The Churchill boys (now ages 8 and 10 years), along with my 2 children at home in Chestnut Hill keep me young and busy. My step-son is now in 3rd grade and my daughter surprised us with her early arrival last New Year's Eve. 2018 could not have started any better! I have two degrees from Boston University: a B.S in Health and Rehabilitation Science and a Master in Public Health (MPH) with concentrations in Maternal and Child Health and Social and Behavioral Science. Despite running around with kids all day, I have a lot of fun, positive energy to burn. I'm a competitive runner, practice yoga, and enjoy the occasional dance or circus class. My goal is to become the next Harriet Thompson, who currently holds the world record for being the oldest woman to finish a marathon at age 93 years. I’m also a huge football fan - GO PATS! ​Nick Holland - Hey everyone! I have been working here now for the last ten years on and off. I initially started out working only in the summers and after school while in high school, and then during the summers while back from college. I received my MBA from Quinnipiac University in Hamden, CT in 2017. Last year was my first time working here full time, you probably saw me in each of the classrooms at one time or another! This year I will be with Nursery II kids in the morning and in the afternoon I will be with our pre-k friends alongside Cailyn. I am a big fan of all things Boston sports and I can’t wait to have a great year with you all! Zack Holland – My name is Zack Holland and I am a 21 year old senior at Roger Williams University in Bristol, RI, studying in business management. I went to Medfield Children’s Center a long time ago, and my mom was a teacher there at the time. I started working at MCC four years ago when I was 15 and really love being around all the kids. I still get to see the kids during winter and spring breaks as well as over the summer. I spend a lot of time with my younger cousins so I’m used to younger kids. In my free time I like video games, hanging with my friends, and watching sports. Jess Adams - Hello everyone! My name is Jess and I am new to MCC. I am very excited to be working as a teacher assistant in the toddler room this upcoming school year. I also will be taking an online course this summer to obtain my teachers certification which I am looking forward to. 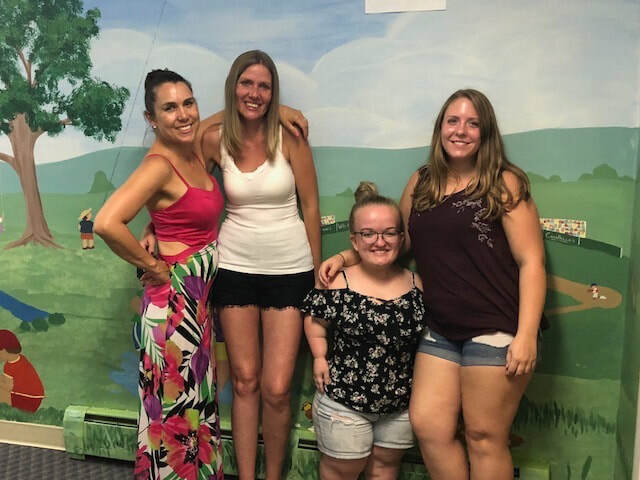 I have achondroplasia dwarfism, which just means that I was born with shorter arms and shorter legs than the average person. However, this doesn’t interfere with my my daily life, and I do not let my dwarfism affect my ability to complete tasks in front of me. I am a graduate from Norfolk County Agricultural High School and studied animal science. I absolutely love animals and I also have a passion for floral design. I am absolutely ecstatic about this new position! I love kids and am looking forward to see all their little personalities shine! Jess Oehley - Hello families! My name is Jess and I am super excited to begin my second year as a Toddler teacher at MCC! I grew up on a small farm in Upton and I have always had a passion for working with animals and kids! Ever since I was six years old, I have also really enjoyed riding horses. When I was younger, I developed a love for nature and I enjoy going on hikes and adventures in the woods with my two dogs. I started babysitting when I was about fifteen, and I have always loved playing and watching the kids at family get togethers! That helped me realize that working with kids is what I wanted to do! I also recently finished my teacher certification course at Fisher College, which was a huge achievement for me. I am looking forward to applying my knowledge in the classroom, as well as watching their little personalities grow and develop in the upcoming years! Heidi Meehan - Hello everyone, my name is Heidi Meehan. I'm a mother of two lovely littles, Paige (7) & Chance (3), as well as one 4 legged little, our cat Theo. This is my first year working at the MCC and I have never been more excited. I love to read books, play all sorts of games, and go for walks/hikes in the woods and trails. My family and I love to go camping and just be outdoors! I'm also a huge animal lover! I look forward to meeting and working with all the children & their families here at MCC. Let's have so much fun! 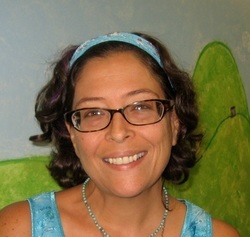 Shawna Ray - Hi Everyone, my name is Shawna Ray and I'm going to be starting to work with your children. They can call me Miss Shawna. I can’t wait to meet you all, I love working with kids and am very excited. I was a stay at home mom for over 13+ years. Before that I babysat in my teen years and worked at a daycare center then got pregnant with my 1st child. I have 3 teenagers now CJ (18) who is starting college, Crystal (15) in high school, and Michelle (13) in middle school. I've been with my husband Chuck for over 20 + years. I've always have and still do a lot of volunteering for my kids’ activities. I'm on the PCC Board as my last year for Remington Middle School in Franklin Ma. My list of volunteering includes cheer mom, Girl Scout Leader, in all class rooms for all 3 of my kids for many years on all different activities. I did teach Sunday School at United Methodist Church in Franklin. I still Volunteer for Music trips for the middle school and high school and also still watch my friends’ children occasionally. I love being outside, doing crafts, Disney movies, taking pictures because making memories is very important to me. My time alone is catching up on my shows and going out with friends and family. Barbara Scardino - Hi Everyone! I am so excited about my new position as a teaching assistant at MCC. I am very lucky to be part of the wonderful MCC family, and treasure the opportunity to guide your children in their social and academic development. 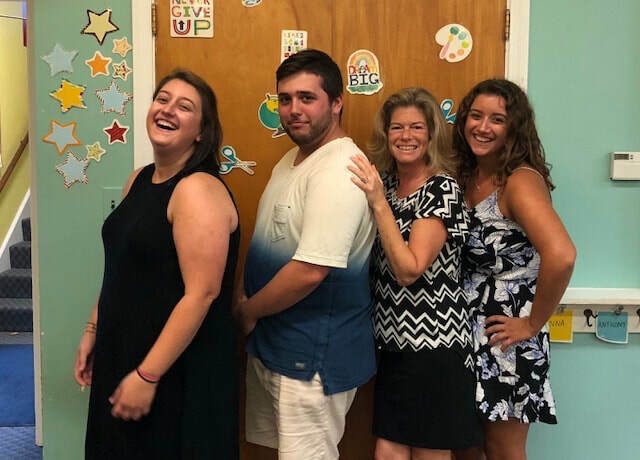 I have always loved working with young children, whether as a school volunteer, raising my own boys (Aaron - 21 and Brandon - 10), or as owner of KidsArt, a confidence-building creative arts program. I earned a Bachelor’s Degree in Public Communications from Syracuse University, and I am currently working to continue my education and become teacher certified. Life for me is very busy, but I wouldn’t have it any other way! My husband Tony and I, live in Franklin with our family, and I also work as a Realtor, helping people buy and sell homes. In my free time, I love to read, do anything artsy craftsy, ski, go to the beach, and watch sports (if I’m not on a ball field or at a hockey rink with 10 year olds, the Red Sox and Patriots are my favorites!). Courtney Zahner - I am thrilled to be starting my first year at MCC. 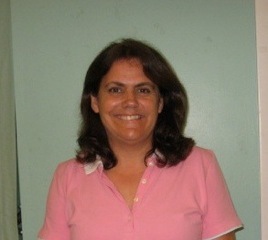 I have my Master’s Degree in Early Childhood Education and have taught for 18 years in both public and private schools. I love teaching!! It allows me to be a kid at heart and to share that enthusiasm with my students. Working with young children, I enjoy creating a fun, engaging learning environment. There’s nothing like brining a children’s book to life with pretend play, making “magic” balloons in science and taste testing apples in math! At home, I am busy chasing my 7 year old son, Jake. He keeps my husband and I on out toes and certainly keeps us young. Nicole Killilea - Hi Everyone! I’m so excited to be joining the MCC family! Some of you might recognize me from local town events. I’ve lived in Medfield for 13 years and I’m a mother to an 8 year old boy who currently attends Wheelock School. I usually spend my free time at my son’s sporting events, basketball, soccer and baseball or working part-time at my salon, NicoleCarol Hair Studio in Wellesley. I’m looking forward to a great time getting to know your children and staring this new chapter in my life!! Frannie McCarthy - Hello! My name is Frannie McCarthy and I’m so excited to be working here at MCC this year. When I was younger I went to MCC myself, and now I get to help teach other kids. I’m a part of the National Art Honors Society at Medfield High School. My hobbies include art (of any kind), writing, animating, skiing, and costume making. I’m a creative person which is one of the reasons I love working with younger kids. I also love animals; I have two dogs and a bearded dragon. I can’t wait to spend the year helping out at MCC! Angela Jimenez - Hi! My name is Angie Jimenez. I am a junior at Medfield high school. In the spring I love to play tennis for my school. After school I am in a club called Amilia’s Light. I also adore animals. I have one dog named Cora Jane that is 4 years old and she’s a little crazy. I also love to babysit and work with kids when ever I can. I’m so excited to start working at the MCC! 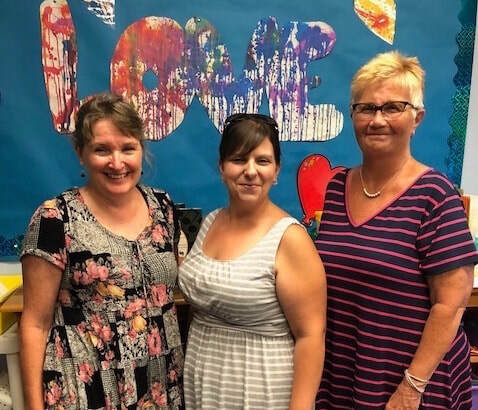 Sharon Maillet - I joined MCC’s family 26 years ago after receiving a degree in education from Framingham State College in 1993 and I have happily been here ever since. 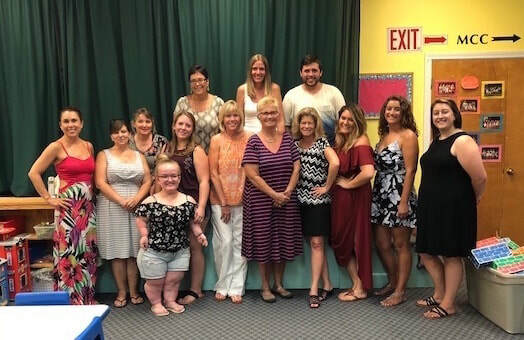 I returned to FSC a few years later to earn a master’s degree in Special Education. It was back to school again in 2001 to complete a Director’s course at Dean College. Now it’s just school at MCC, my favorite school of all, my home-away-from-home. After years as a PreK and Nursery teacher, I moved into the office as Director. My first love will always be teaching, so I treasure the time I get to spend in the classroom. One of my favorite parts of the day is opening the doors to welcome everyone. I’m the lucky person who gets to see those adorable little noses pressed flat against the windows as they wait to come in. Another favorite part of the day is watching the kids walk by the office on their way down the hall. I love to hear their laughter and heartwarming conversations when they don’t know I’m peeking. When I’m not at home at MCC, I’m at home in Hopedale where my husband and I cherish every moment with our son Josh, who is an MCC graduate and now a seventh grader, and Brandon who is 4 and part of MCC’s family. ​Jeanne Baker – I am delighted to be returning to MCC for my 16th year. After having my four children attend MCC (many years ago), I knew it was a place that I would happily continue my career as an educator. It is a pleasure to work with such wonderful children and families. I graduated from the University of New Hampshire with degrees in Education and Psychology. My family and I love living in Medfield. 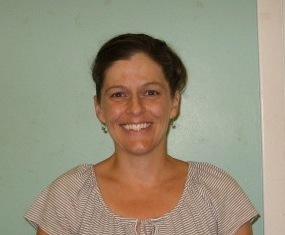 ​Kristin Henry - It’s hard to believe that summer has come and gone, and we are already starting a new year at MCC. I am so excited to be back at school and am looking forward to greeting my friends each morning with smiles and hugs. 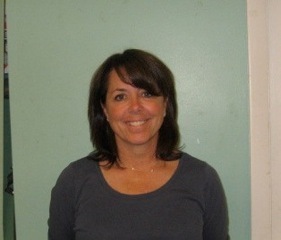 A little about me…I moved to Medfield three years ago with my husband, Brian, and children, William and Reidy. William is in the 5th grade and Reidy is in 2nd grade. When not at MCC, I enjoy spending time with family and friends, traveling and reading. 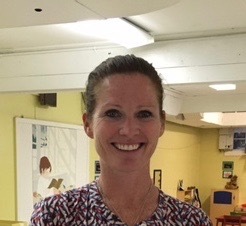 Kaitlin McNulty - As a new resident of Medfield, I was thrilled to find MCC as a preschool for my 5-year-old daughter. The MCC community was so warm and welcoming to our entire family and we felt so thankful to be a part of it. I am so excited to be joining the team here at MCC as a PreK teacher! Now that both of my children are in full day grade school, I am eager to get back into the teaching that I loved for years before I had my children. As a Montessori trained Early Childhood teacher, I will be bringing some of the “follow the child” philosophy to my classroom. I love to see the PreK age group thrive as they choose their own path in learning and develop a true love for school. I can not wait to meet all of my little friends!